Our remit at Healthwatch Norfolk is to gather the views and experiences of Norfolk people about health services and social care services and then use this information to highlight issues with providers and commissioners and influence change for the better in Norfolk. This means we are constantly engaging with the public at venues and events all across Norfolk and hearing about good and bad experiences. We write reports which are sent to providers and commissioners with recommendations as to how services can be improved. We have staff, trustees and volunteers that attend over 100 local partnership boards and other fora in the County (and Region) including a place on the Norfolk Health and Wellbeing Board, the Norfolk Safeguarding Adults Board, and a place at the table at several commissioning meetings. We have been involved with the Sustainability and Transformation Partnership and instrumental in the establishment of the Stakeholder Group and are keen to ensure that the VCSE Sector are fully involved in discussions and plans to reshape services in the future. My previous roles have included CEO of Yare Valley CAB, Operations Manager of Norfolk CAB, and Service Director of Norfolk Family Mediation Service. This means I have nearly 15 years of experience working in the voluntary sector and am familiar with issues of uncertain and reducing funding, project/time-limited funding, reducing numbers of volunteers, the benefits and challenges of working with and training volunteers, and the difficulties of VCSE partnership working when there is competition for funding. I believe that it is crucial that the VCSE Sector demonstrates its ability to work collaboratively, increase efficiency and reduce duplication wherever possible. Building relationships and trust amongst the sector and with funders/commissioners is of utmost importance. We pride ourselves at Healthwatch on our ability to work collaboratively and build trust with other organisations even if this means delivering uncomfortable messages at times. I feel that my voluntary sector background together with the connectivity and reach of Healthwatch would be of benefit to the Norfolk VCSE Sector Leadership Group. I would like to be part of the VCSE Sector Leadership Group as the purpose, objectives and principles of the group align incredibly well with those of the charity I lead (Future Projects) and with my own personal values. I strongly believe that the VCSE sector must work in a joined up way in order to overcome the changing socio-economic environment, and to provide effective, valued, and impactful services for society’s most overlooked communities. As such, I am interested in developing whole system approaches in collaboration with key partners from the sector in order to affect and influence decision makers, to improve practice and outcomes, and to ultimately ensure that people in need receive the support, services, and help they require. Moreover, I am interested in addressing the systemic and structural issues which lead to the inequalities which serve to create demand for VCSE services in our society. In order to do that, the VCSE sector requires a strong, coordinated voice. Throughout my 15 years working in the VCSE sector I have undertaken a range of roles which have given me a good insight to the key functions associated with running successful VCSE organisations; Funding, Finance, Human Resources, Governance and Management, Statutory Compliance, Safeguarding, Operations and so on. I believe this gives me a unique understanding of the way in which organisations operate and the pressures and challenges they face both operationally and strategically. In particular, my experience at Future Projects over the last eight years has provided me with in-depth knowledge and understanding across a range of delivery themes such as: health, education, youth, offending, volunteering, poverty and low pay, homelessness, SEND, social justice and more. Future Projects delivers a range of services under these themes across Norfolk, including a Therapeutic Independent Special School for pupils with complex Social, Emotional and Mental Health Needs and SEND, employment support programmes for those furthest from the labour market, community development and inclusive growth programmes, advice and guidance services in highly deprived communities, social prescribing and social isolation programmes, specialised finance and debt advice services, training and skills development programmes, volunteering programmes, and reducing re-offending programmes. I have good networks and connections amongst public and private sector leaders, and a large network of local employers across Norfolk through my role as chair of Living Wage Norwich - in which I am responsible for driving the local agenda for fair pay and responsible employment practices. I am also engaged with several consortia and partnerships across Norfolk in delivery of large scale service delivery through European, Central and Local Government funding streams. Ultimately, I believe I have a broad range of knowledge and experience across several of the VCSE Sector Leadership Group’s stated themes and would be a strong advocate and influencer on behalf of the group - and the beneficiaries each respective member serves. DIAL was established in 1985 and I have been managing the Charity since May 2010. I have been at the forefront of ensuring we provide information and advice on all aspects of the Welfare benefits system, together with a Debt Advice service with qualified advisors registered with the IMA (Institute of Money Advisors). Throughout the last few years we have successfully worked in partnership with both statutory and voluntary organisations, working on projects led by Great Yarmouth Borough Council – Neighbourhoods that Work, DWP with the role out of Universal Credit and the challenges it raised, and Building Better Opportunities led by East Coast college allowing expansion of some services to being County wide. The latter project has given us experience of working as part of a European Union funded bid and increased administration. Our recent success in leading the Social Prescribing project with Great Yarmouth and Waveney Mind as our partners, is evidence of our passion and commitment to the local area. We also have experience of delivering Lottery Funded projects with our existing project finishing in 2021. I am very passionate about partnership working as I believe it is a strong catalyst for bringing together different strands of the voluntary, public and private sector to address barriers for some of Norfolk’s most vulnerable people. Successful partnerships involve those who have enthusiasm, drive and commitment to making projects successful and who are willing to share ideas and resources. Working collectively we can make a real difference to the lives of the communities which we support, many of these being deprived and vulnerable individuals. I would welcome the opportunity to be part of the Sector Leadership Group and be a voice for the Great Yarmouth area, which has a diverse and transient population and different needs to other parts of the county, whilst helping DIAL to take forward our ambitions in becoming well known within Norfolk. I believe I have a wealth of experience in a wide range of issues affecting our communities and have worked hard to build a strong network of organisations within the area. I feel that this will benefit the Sector Leadership Group moving forward. I am an ambitious individual who is incredibly passionate about ensuring the voice of Norfolk’s VCSE sector is heard. I strongly wish to make a positive difference within my local community and believe a joined up working approach to community services will enable this. With the ever-changing needs of our community, increasing demand on services and the challenging financial restraints of the public, private and VCSE sectors, I believe that integration and intervention is key to ensuring community services are of high quality, and meet the needs of their service users. I am a driven, enthusiastic and professional individual with over 10 years’ experience working with children, young people and the community. Previous to my role as head of youth services at OPEN Youth Trust I worked as a youth support worker, performing arts teacher and learning support assistant. I have a proven track record of managing multiple youth, disability and arts projects successfully. This experience has allowed me to develop sound knowledge on the current needs of young people in Norfolk and that of the voluntary sector. Managing and coordinating various projects has also allowed me to effectively lead various groups of people and a staff team. Strong interpersonal skills have enabled me to identify, manage and develop positive relationships with stakeholders and partners. I believe that working in collaboration and partnerships strengthens organisations capacity ensuring better outcomes for service users. My role at OPEN Youth Trust has seen me successfully manage a range of partnership projects including partnership arrangements with Talent Match New Anglia, Norfolk and Norwich Scope Association, Norfolk County Youth Orchestra, Future Radio and many more. My exploratory and analytical skills are of high quality, I continuously seek to understand the current economic market and services for Norfolk people ensuring I seek the onions of the people they serve. Through my role at OPEN Youth Trust I have developed knowledge around evidencing impact and need. This enables me to strategically develop OPEN’s service ensuring it meets the needs of its users. I am able to evidence and seek out gaps in provision developing resourceful methods to successfully fill these gaps and sustain services. My experience sitting on the board of trustees for a Norfolk based disability charity has strengthened my strategic and financial management skills. Sitting within one of the Norwich Opportunity Areas working groups demonstrates I am willing and able to work beyond the needs of my charity and look to support Norfolk as a whole. I am able to manage my time effectively ensuring I can actively participate in the VCSE sector leadership group. I pride myself in being able to ‘think outside the box’, I am solution focused and believe I can make a positive contribution to the issues that matter to Norfolk. I joined Musical Keys as CEO in April and the last six months have given me insight into the unique challenges we face as a sector in Norfolk. That experience – building on the knowledge and skills I have gained from working in the public, commercial and voluntary sector over the last thirty years – is why I am keen to be part of the Sector Leadership Group. I first came to Norfolk as a student and after a number of attempts to escape, I now happily call the county my home. I care deeply about the issues faced by people living here and how we, as a sector, can make a difference to people’s lives. Before joining Musical Keys I spent six years working for a local Member of Parliament. That gave me a real insight into the range of challenges people face in a rural county with an ageing population and rapidly retreating levels of public service provision. I was a Trustee of The Hamlet for three years and I have previously worked as campaigner for disability rights with Leonard Cheshire Disability – so I have experience of the VCSE sector as manager of a local charity, as a volunteer trustee and as an employee. The government’s new Civil Society strategy gives the sector a chance to raise the voice of charities, voluntary organisations and social enterprises. Years of public spending cuts are making it harder to deliver services effectively and increasing demands on our sector to plug the gap. We need the will and the political skills to make our voice heard in the debate in Norfolk and nationally. I am a serving County Councillor and I recently moved the motion at County Hall calling for a halt to planned closure of Children’s Centres - just one of the ways that services are being cut back for families. 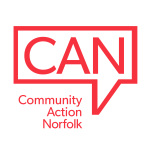 We have huge potential as a sector to make a difference to people’s lives in Norfolk by working together to make our voice heard, by harnessing the power of volunteers and making use of all the knowledge and skills we have between us.